We’ve all heard the phrase before – an apple a day keeps the doctor away. But is there any basis to this or was it just something our mom’s said to try to convince us to eat healthy as kids? Turns out, Moms do know best! Apples come in a variety of colors and types, but one thing they all have in common is their nutritional and health benefits. We can dissect the apple and determine what all the fuss is about. First, let’s look at the skin of the apple. In addition to housing insoluble fiber (also called roughage or dietary fiber), which is responsible for giving us the sensation of being full and also helps keep our bowels moving, the skin is where most of the nutrients are found. 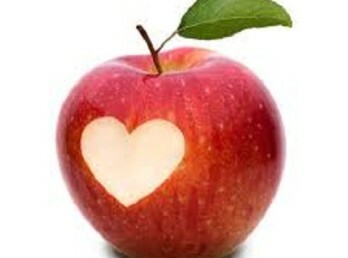 Quercetin, a strong antioxidant of the flavonoids group in found in the skin of apples. (Quercetin is also found in onions, wine, teas, raspberries, red grapes, oranges, lemons, cherries, and green vegetables.) There are a few ways that quercetin helps us. First, it protects us against free radicals that oxidize the cells in our body (which could possibly lead to neurological illnesses). It also blocks carcinogens in the environment. Studies also show that is slows the development, and possibly the spread, of cancer cells in our body by preventing DNA damage. It is one of the major anti-inflammatory substances in the body and helps by blocking the release of histamine triggered by allergens. In case that is not enough, there are respiratory benefits associated with quercetin as well, such as reducing asthma symptoms and lung cancer. Don’t think eating the skin alone is good enough! The inside of the apple also offers a myriad of health benefits worth mentioning. Insoluble fiber is found in the center of the apple and helps aid in digestion. Apples do not contain any cholesterol, and in fact, help lower cholesterol by moving food through the digestive tract and minimizing the absorption of cholesterol into the bloodstream. Pectin, one of the soluble fibers found in apples, is a natural anti-inflammatory and anti-bacterial agent. The high water content in apples is also beneficial as it increases our water intake, something many of us don’t get enough of. Apples are low in calories, making them a good snack choice, and are also low in sodium, which helps flush excess water weight from the body, keeping the number on the scale where we want it to be! So what are you waiting for? Whether you are trying to lose weight, or just want to be as healthy as you can be, with their benefit in disease prevention, weight lass, gastrological and respiratory function, apples are a tough snack choice to beat. Besides, keeping the doctor away is motivation enough to grab an apple and take a bite!